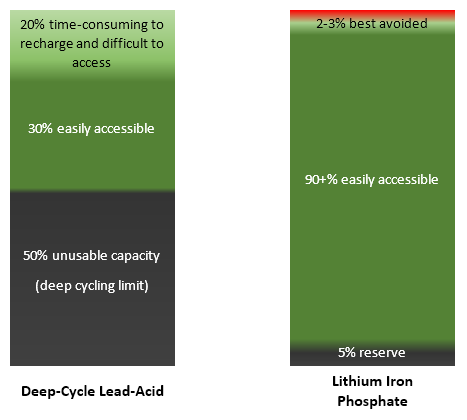 This article is part of a series dealing with building best-in-class lithium battery systems from bare cells, primarily for marine use, but a lot of this material finds relevance for low-voltage off-grid systems as well. The development and mass-manufacturing in recent years of large-size lithium-ion battery cells for electric vehicles and grid-tied electricity storage has made them broadly accessible. The very modest lithium battery I built on board the sloop Nordkyn is the best battery I have ever had. It solved all capacity and charging issues. I haven’t run out of power once since it was commissioned. I never started the engine only to recharge it. I can run power tools off the inverter without running the engine and it never complains from low voltage. This 400Ah lithium battery pack, here in the process of being installed, takes a fraction of the space used by the previous deep-cycle lead-acid batteries, offers at least 10% more usable capacity and brings weight down by 128kg. Note the silver grey battery protection module to the right. The cells will be clamped together and secured into the locker by the time the job is finished. The incentives for using lithium iron phosphate (LiFePO4) batteries on board yachts are primarily long-term performance and light weight. If the installation is well engineered, a cost benefit will also result eventually. The plague of lead-acid batteries has always been sulphation: as soon as they are left in a partial state of charge, they degrade and quickly lose their capacity as a result of hard lead sulphate crystals growing onto the plates, preventing recharge. The problem becomes particularly prevalent when living aboard, because batteries hardly ever manage to recharge much beyond 80% as a result of routine power consumption and lack of time for absorption. To make this worse, lead-acid batteries are slow to charge, and only get worse as they grow older. They are heavy and about half of the installed capacity is mandated only to limit the depth of cycling and cannot be accessed. This leaves an effectively usable capacity of 30-35% only, between deep discharge down to 50% and a maximum achievable charge state of 80-85% when the bank is in continuous service. Furthermore, this is only achievable as long as the battery is still in good condition. These issues are completely eliminated when throwing the lead out and adopting lithium cells. A bank of six Endurant CR232 lead-acid batteries, dead after two years in service on board a 44′ catamaran. The cost figures used above are indicative and were researched in 2015, based on quality products. 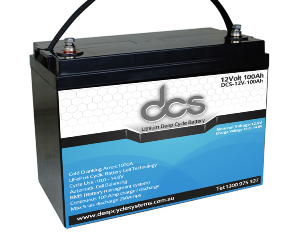 In the case of lithium, there is an added one-off cost of about $500 to protect the battery and some alterations may be required to existing systems; those can also come at some cost. In a cycling application, typical when living aboard, even at an installed cost of $1500, the whole-of-life cost of the above lithium system would come out at half of the price tag of AGM batteries. Lithium is not automatically a sensible economical choice for vessels that are used infrequently; there, the low cost of basic flooded lead-acid batteries that would be kept at full charge nearly all the time by a solar installation for example is difficult to compete with. Lithium batteries don’t suffer from low charge or deep discharge (down to a limit) and easily offer more than twice the usable storage for the same nominal capacity. They charge much faster; they can literally absorb all of the available current until almost full. They are near 100% current-efficient, 1Ah in means about 0.997Ah out: they waste very little energy. This also means no lengthy, wasteful absorption during which good electricity is turned into heat and gases. They hardly suffer from cycling in marine applications. They hardly self-discharge over time (provided they were never abused). They provide a noticeably higher and much more constant system voltage during discharge, over 13 volts. They are much lighter, much less toxic than lead-acid cells, fully sealed and don’t generate explosive gases, even internally. They last many times longer than a lead-acid bank while providing much higher performance throughout, provided they are treated correctly. Those are very strong drivers for throwing the lead out, first and foremost for people who live on board and therefore use power every day. 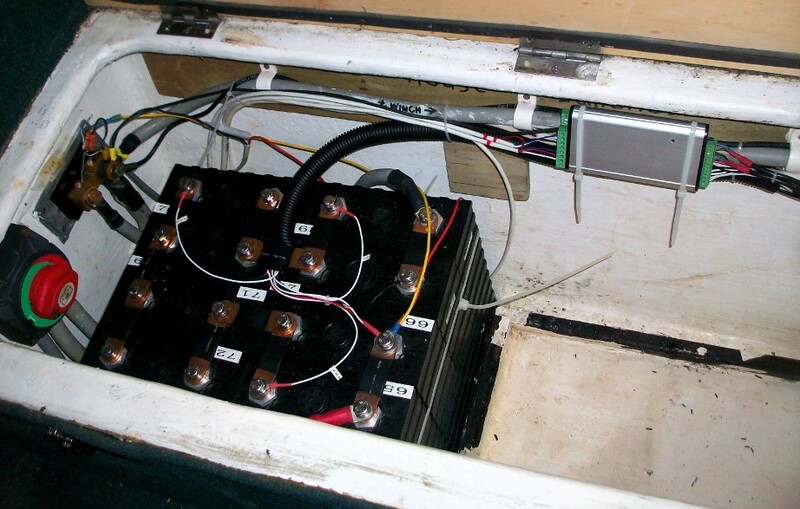 If, instead, the boat is only occasionally used, any decent installation including solar panels is normally able to maintain much cheaper sealed lead-acid (SLA) batteries in fair working order for many years and the business case for installing lithium cells doesn’t automatically stand as well. 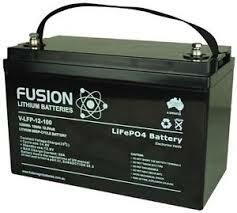 Lithium battery cells are more costly initially. A lithium bank is an investment, the return of which is only achieved if it lasts many, many years. Lithium cells are very prone to electrochemical damage if something goes wrong electrically around them and therefore require some additional protection equipment. Sustained operation at freezing and sub-freezing temperatures is questionable. Installation in hot environments, such as engine rooms, is not an option either. A lithium battery is not a drop-in equivalent for a lead-acid. Systems around it need to be re-assessed and nearly always modified. This equally applies to “packaged” lithium batteries that come with internal protections and marketing claims that they can be installed as direct replacement. They can’t. 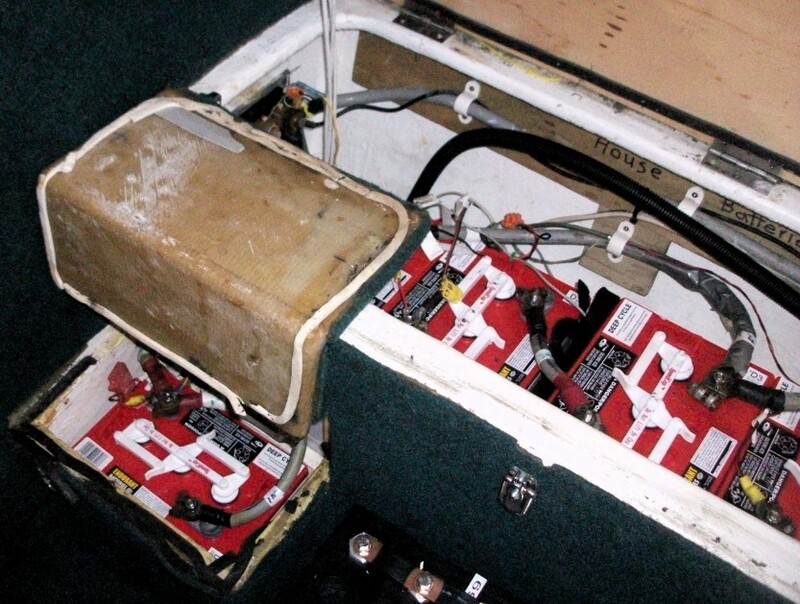 Engineering issues are often poorly resolved in marine installations and some lithium batteries installed on yachts as DIY systems have been associated with much anger and bitter cringing, for no reason of their own. Many of these installations have ended in a very expensive fiasco. Poor engineering and inept advice from battery resellers and marine electrical equipment manufacturers are the #1 problem with lithium today. Actual life expectancy depends a lot on cell manufacture, as well as how they were treated afterwards. Cheap lithium cells from a questionable source may not prove to be much of a bargain at all down the track. The above list highlights that the drawbacks are essentially up-front. If those can be addressed properly, it is all go afterwards. It is derisively easy to obtain a working system with a lithium battery bank on board – just put it in. It is unlikely to last any amount of time, it is unsafe and anything but clever. It is also a good way of eventually losing a significant amount of money. Many, many lithium house banks have been lost to specific and completely avoidable incidents so far. A number of others are in service with damaged cells, which is beyond questionable from a safety point of view. We don’t know what calendar life to expect from a lithium bank on board. Some decent marine installations have been going strong since around 2008 (as far as I know) with no end-of-life in sight about 7 years later now. 10-year appears easily achievable and more is very likely. Some installations appear to have exhibited significant losses in capacity after a few years only, the cause of which is not always easy to pinpoint. There is a lot of misinformation and lack of understanding of this battery technology, including and especially amongst people marketing marine electrical equipment. The technology is not where their core interests lie. There are a lot of marketing claims from manufacturers for equipment that is in fact largely unsuitable for lithium chemistry, or for building marine house banks, even when specifically advertised for lithium. Drop-in, packaged, lithium batteries with integrated “management” sold as replacement for lead-acids are products that should be protected against severe incidents, but fail to resolve everything else if hooked up to standard lead-acid charging system. No amount of “claims” can change that, because some of the engineering issues present are external to the battery. Their capacity and construction are often sub-standard however. Commercial solutions for lithium electricity storage on board are currently priced as a luxury option available to the top-end market and entails buying an entirely new charging system (in most cases) as well as the batteries themselves – and installing everything from the ground up. There appears to be three options for installing lithium batteries on a yacht. Two only are actually valid and one only is cost effective. Lead-acid charging systems are generally incompatible with lithium batteries and damage them. Achieving longevity instead requires building a system, where all components operate harmoniously, not only within the specifications of the battery cells, but also following best practices with this type of chemistry. Engineered lithium solutions are being offered by several of the big names in marine DC power systems. The starting point is always a block of LiFePO4 prismatic cells associated with a protection circuit and (usually) two disconnectors, one to isolate charging sources and one to disconnect the loads. Several brands in the marine electrical market offer pre-assembled and protected lithium battery packs, albeit at very high cost. Buying the battery is just the beginning however and the system is then complemented by various alternator control devices and charge regulators. Integrating these batteries with non-proprietary equipment can be a major headache or result in significant technical issues, because – once again – building a lithium system is not just a matter of replacing the battery. Charge control regulators, and solar charge controllers in particular, offered by some of these companies frequently make little or no effort at all to ensure the bank doesn’t get “floated” at high voltage, which invariably translates into a much shortened life. In this regard, those are not well-engineered systems, but these companies also sell the same LiFePO4 battery cells available to the DIY builder, just repackaged and re-branded at high cost with some associated embedded protection circuitry. However, from a safety and reliability point of view, those are saleable systems. The stumbling block is the astronomical price point, which has remained remarkably stable for a number of years now, and sometimes concerns associated with longevity. There is a growing offering from numerous obscure brands for direct “lead-acid replacement” lithium batteries. Those are often assembled from a large number of small cylindrical cells complemented with an over-voltage/under-voltage protection circuit and a crude cell balancing scheme. They are small-size, cheap, self-contained and often poorly executed versions of the battery systems mentioned above. They are almost invariably advertised with charging voltages as high as 14.4-14.6V (and now 14.8V as of 2018! ), which would quickly damage the cells: nothing within the battery can possibly do anything about the charging voltage being excessive, for too long etc. The high-voltage protection is always set far too high in order to allow connecting them to any automotive system without tripping it: it just has to be. It is a “catastrophic failure protection” only, it won’t prevent ruining the cells gradually. If the high-voltage protection trips, it will open the charging circuit and destroy the alternator if the engine is running: this is the only thing it can do! As long as the charge and discharge currents are within the capability of the disconnect relay, as a single unit, such a battery could perform acceptably on an installation where charging voltages have been adjusted suitably low not to stress lithium cells. In this case, the balancing circuit will never manage to operate. They are generally not suitable for installation in parallel for building larger systems, because this equates to paralleling strings of cells, even current distribution cannot be preserved and there is a risk of burning out the protection relays. Some of these “replacement” packaged batteries have continuous current ratings as low as 30A… because high-current disconnect relays are expensive. These issues around the adequacy of the protection system don’t always arise however: sometimes there is simply none built-in! More recently (2018), marketing fuelled by the need for differentiation has started to outperform electrochemistry with vendors claiming to have access to their own branded “magic” cells that resolve all issues and outperform the competition to lure buyers in. This is how some packaged LiFePO4 batteries now come with fabulous claims of suitability for operation at extreme low temperatures, no memory effects from partial cycles and extremely dubious performance curves. While the integration of a BMS is a step forward in the right direction from earlier claims by the same crowd that it was “unnecessary”, it still fails to resolve very fundamental issues. Such packaged batteries remain largely inadequate for building large systems and essentially have no place on board ocean cruising yachts. The primary driver for designing and building energy storage systems on board yachts starting from bare battery cells instead is cost. Longer life is also definitely achievable when comparing with commercial offerings, as those are designed to provide performance with rather limited thoughts given to true battery longevity. Bare battery cells are readily available on the market at much more affordable prices than when purchased as pre-assembled packs. The goal is therefore integrating them into safe, decent systems and leverage off the cost advantage, but the savings are only going to be achieved if the installation first performs and then also lasts. The task is definitely possible, but it involves overcoming a few challenges. Experience has shown that getting a system that performs after installation is near-trivial; building a safe installation protected against adverse incidents is a little more involved, and making it last the distance can be a different story again. The objective here is discussing the engineering and construction of safe and highly dependable DIY systems, not launching in a shopping spree in the tens of thousands of dollars. So the remaining material on this site about lithium power on board deals with assembling, installing, commissioning and using such DIY systems. There is a certain amount of knowledge anyone should gain before committing to building (or even changing to) a lithium battery system however. The next article in this series is aimed at summarising and explaining what lithium battery cells are, why they are different and what needs attention. It is a more effective approach than wading through a multitude of research papers discussing lithium-ion battery cells or trying to separate opinions and facts from conflicting sources. Before even considering sourcing any battery cells, the on-board electrical system must be reviewed and all connections pertaining to loads must be physically separated from charging sources. On a standard, tidy installation, it all leads to positive and negative busbars. At a minimum, the positive bus must be split into distinct charge and load buses and the corresponding cabling moved. High-current DC disconnectors must be installed in the paths between the battery and the new busbars, so the battery can be isolated from loads and/or charging sources if needed. 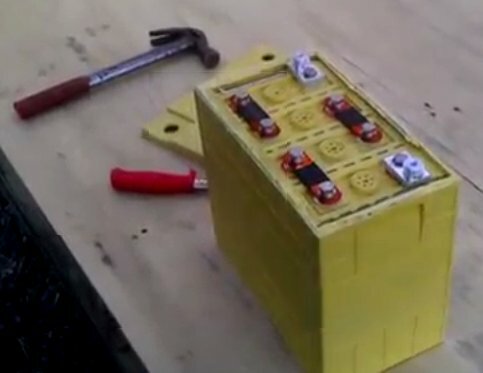 The cells that will make up the battery need to be charged and carefully balanced before they can be interconnected to form a bank. Electronic protection circuitry must be installed to ensure that none of the cells can ever exceed their operating voltage limits and the battery never starts heating up. All charging sources and regulators that will ever feed the new battery need to be re-assessed for suitability: either they can be reconfigured to operate acceptably, or they will need replaced. It is a project, and it needs to be implemented either very well or not at all. Can you explain in more detail why you say the negative side of sources and loads also need to be separated? It seems you want all current, whether in or out to be going through a single path (shunt or hall effect sensor) anyway. It would seem that high side contactors can be used on the positive side and that’s enough. What am I missing? p.s. very nicely done explanations on your pages, thanks much. I had to search the page and re-read my text to understand the motivation for your query. I will now alter the way I worded this to clarify that only the positive bus needs to be split to segregate charging sources and loads. A common negative is usually fine. There is one situation where you would split the negative bus and it is if you wanted to sense (on the low side): 1/ current produced, 2/ current used and 3/ battery current to get a full picture of the current flow in the installation. This would require three sensors however. The most common arrangement is sensing battery current only and then a single shunt or sensor between the common negative busbar and the battery bank is all that is required. I have been working on an article detailing the electrical design on board and available options to integrate a lithium bank, but producing this kind of material is extremely time consuming and it is forever competing for time with engineering and design work. First, you really need to make sure that you can’t end up with both buses linked and no battery in the system. If this happens, you can damage the entire electrical system on board. Good design easily rules out this possibility, but the choice of a common junk-grade BMS solution by many people has caused it to happen many times due to the single battery disconnect contactor. Second, think about what will happen if you face a high-voltage disconnect where the charging sources get isolated from the bank for protection. Some devices can fail if disconnected under load, or can generate fairly high voltages afterwards on the now open charge bus and damage other sources. A lot of poorly engineered DIY lithium systems work great initially, until something suddenly happens that results in a great deal of expensive damage on board. We don’t hear so much about this on the internet, but it is surprisingly frequent. Engineering the installation properly requires a lot of thought, but it is perfectly achievable. Thank you for pointing out the need for clarification in this article, much appreciated.